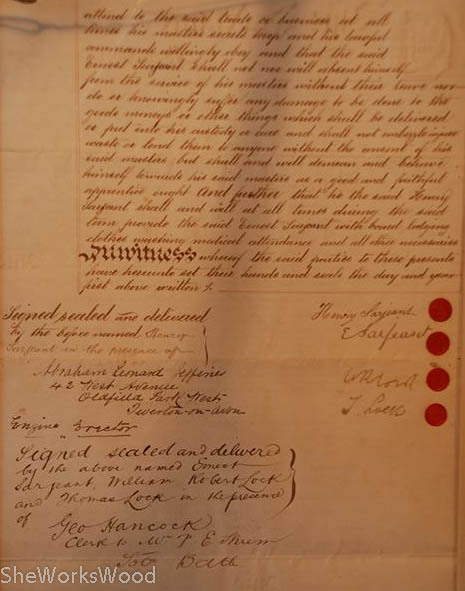 For now here is the best picture I have of Ernest Sarjeant’s apprentice / indenture papers. Ernest’s apprenticeship was from 1892 to 1897 under William and Thomas Lock. Hopefully, I’ll have a better copy soon because they’re pretty difficult to read. You can make the picture bigger by right clicking on it and opening in a new tab. Here are two of the tools I’ve finished cleaning. They are ready for work. The middle saw is Ernest’s, a Disston back saw, ready for sharpening and work. This entry was posted in back saw, brace, E. Sarjeant and tagged Apprentice, back saw, brace, Ernest Sarjeant. Bookmark the permalink. That is so awesome. I love history, and having tools that come with a history is extra special. Me too! I have some tools that I’ve rehabed but have no idea what history they have. It’s very exciting to know the story behind these as well as knowing they work well because he certainly used the heck out of them. I can understand giving the tools to somebody who will use them; personnally I would have kept the family archives. Oops, it seems my comment was not pertinent. No, I understood it as a statement of your opinion. The tools I’m giving away are duplicates of ones I have and I’m not a collector. 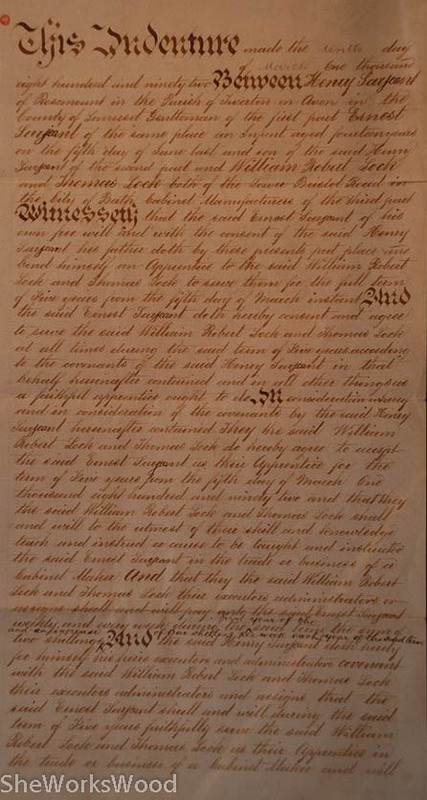 Indenture papers are some serious kind of woodworking cool! I know. I’m trying desperately to get copies of these. Right now they’re framed and picture are all I can get. Here’s hopin’.